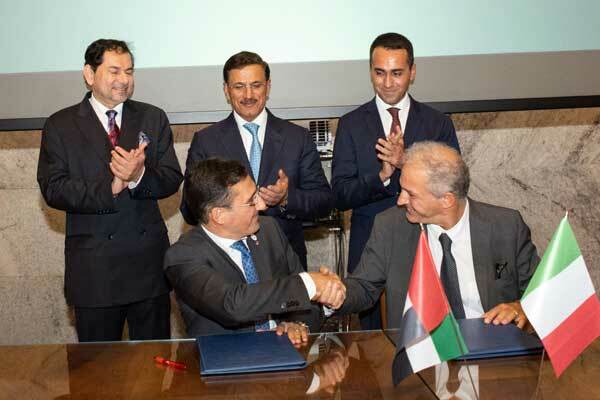 Etihad Credit Insurance (ECI), the UAE Federal export credit company, and SACE, the Italian export credit company (CDP Group), have signed a memorandum of understanding (MoU) to enhance business opportunities between the UAE and Italy. The signing ceremony was part of the 6th meeting of the UAE-Italy Joint Economic Committee held recently in Rome, Italy. The signing of the MoU took place at the Ministry of Economic Development in Italy, in the presence of Engineer Sultan bin Saeed Al Mansoori, UAE Minister of Economy, and deputy chairman of the board of directors at ECI; Luigi Di Maio, Italian Minister for Economic Development; and Engineer Saed Al Awadhi, chief executive officer of Dubai Export and Development Corporation, and board member and chairman of the executive committee at ECI, said a statement. Under this MoU signed by Massimo Falcioni, chief executive of ECI; and Alessandro Decio, chief executive officer of SACE, the two national export credit companies have expressed commitment in strengthening the cooperation between UAE and Italy through the mutual sharing of expertise as well supporting the business relations of both countries. One of the main highlights of the MoU is the intention to enhance trade between the two countries with focus on Halal industry through Shariah-compliant insurance and finance solutions, it said. Furthermore, ECI and SACE have agreed to create a dedicated task force and collaborate on seven work areas: insurance, reinsurance and collections initiatives; information sharing; technical training programmes; halal industry and Shariah-compliant insurance and finance solutions; trade promotions (B2B events and workshops); investments; and SME programmes, it added. “Italy is one of the major trading partners of the UAE in the European Union, while the UAE is also a major trading partner of Italy in the Arab region. Through mutual cooperation in extensive areas, this agreement is set to further cement the growing bilateral trade between the two countries,” he said. “Our office in Dubai, with a €5 billion ($5.76 billion) project pipeline, will play an active part in the Task Force confirming its role of ‘Italian bridge’ in the UAE,” he added. The trade volumes between two countries have exceeded €6 billion ($6.91 billion) in 2017. UAE ranks number one in the Middle East and North Africa (Mena) region for Italy's agriculture and F&B exports while Italy's imports from the UAE have also been growing.